Additional Info: It is home to some of the finest medieval castles and forts in the world. 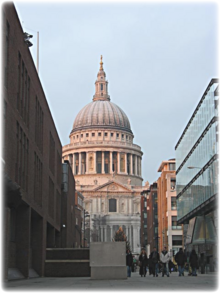 It is also known for the many grand country houses and for many medieval and later churches and cathedrals. England is home to so much that has formed the world and is known and taught across the world. 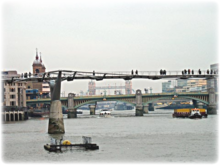 London, the capital, is the most visited capital city in the world and no matter how many visits one takes, there will always be something new, something you missed last time. But one oft missed City in England is the former capital of the country, the city of York. 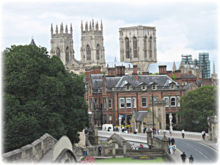 In Roman times, it was called Eboracum; In Viking times, Jorvik, and now is home to ruins and artefacts from both visiting cultures, not to mention having the largest Gothic cathedral church in Northern Europe, the York Minster. Those who make the time to stop in York (often on the popular train route from London to Edinburgh, which stops for a reason in York only!) are amazed by how much this historic city, populated by approx. 185,000 people, has to offer. York History: The city was founded in AD 71. After the establishment of the Kingdom of England, York was regarded as the capital of the North, and from 1537 to 1641 housed the Council of the North. 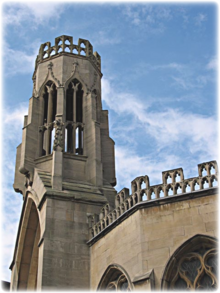 Whilst the idea of the North being a separate province with its own capital has long since disappeared from secular politics, the Church of England has retained the concept, and York remains the seat of the Archbishop of York, metropolitan bishop of the Province of York. York is built on the location where two rivers come together, the large River Ouse (which flows into the Humber then out to the North Sea), and the River Foss. Many elegant bridges can be viewed in York crossing the River Ouse at various locations. The medieval walls that enclose the city of York are built atop original Roman walls. One can walk around the City almost entirely on the walls enjoying views of the City and the surrounding areas from a unique perspective. After the Norman Conquest of 1068-1069, William the Conqueror established two Motte and Bailey wooden castles in York. York Castle between the Rivers Ouse and Foss and what is now Baile Hill on the South Bank. York Castle is mostly removed but rebuilt in stone and still standing is Clifford's Tower, a fortification built on top of a raised earth mound, a "motte", built between 1245 and 1265. 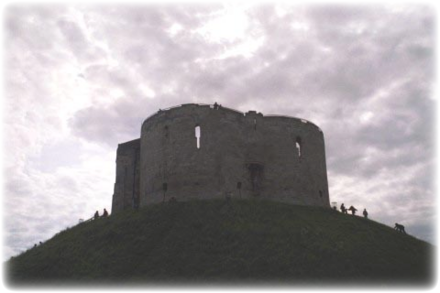 The motte of Clifford's Tower is believed to be the "hill" that the Grand Old Duke of York marched 10,000 men up and down in the nursery rhyme, although there are several other theories. A visitor's favorite is the Shambles, a narrow medieval street lined with shops, boutiques and tea rooms. Most of these premises were once butchers' shops, and the hooks from which carcasses were hung and the shelves on which meat was laid out can still be seen outside some of them. 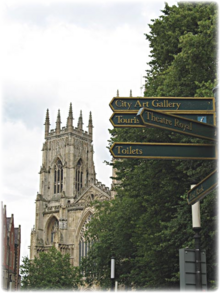 The city has many museums, including the Castle Museum, Yorkshire Museum & Gardens, JORVIK Viking Centre (a ride takes you through a viking version of York with sights, smells and sounds of real life in those times), the York Art Gallery, Richard III Museum and the Merchant Adventurers' Hall. 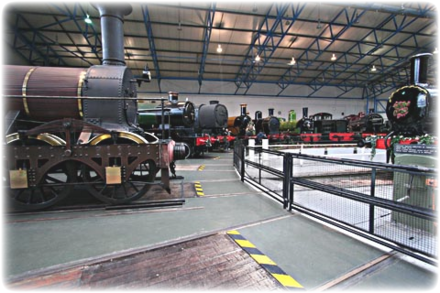 A favorite for those tiring of culture and beautiful scenery (and those more engineering minded), is the National Railway Museum, which is situated just beyond the station, and is home to a vast range of transport material and the largest collection of railway locomotives in the world. Included in this collection are the world's fastest steam locomotive LNER 4468 Mallard and the world famous 4472 Flying Scotsman, which is being overhauled in the Museum. Recently installed beside the York Museum is the Yorkshire Wheel, like the London Eye, offering spectacular panoramic views of York's historic city center, including the Minster, the River Ouse and the countryside beyond the city. Entrance to the museum is free, but the wheel is 6 GBP for adults and 4 for children. York is also noted for its wealth of churches and pubs. Many of the remaining churches in York are from the medieval period. It is said that York contains one pub for every day of the year, and that there is no point within the city walls where one can stand and not be able to see at least one pub and at least one church. The only way to verify this is to go see! Wander lonely as a cloud, as presumably Wordsworth did when he spent many of his years wandering in England's Lake District, home to some great peaks and beautiful lakes. The Lake District is a rural area in northwest England, not far from the not too fabulous coastal destination of Blackpool (the poor man's Vegas, if you will). The central and most-visited part of the area is contained in the Lake District National Park - one of fourteen National parks in the United Kingdom. It lies entirely within Cumbria, and is one of England's few mountainous regions. 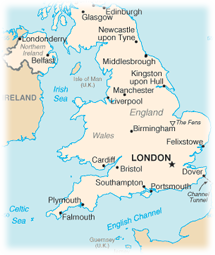 All the land in England higher than three thousand feet above sea level lies within the National Park. The Lake District also contains Scafell Pike, the highest mountain in England. The Lake District's location on the northwest coast of England, coupled with its mountainous geography, makes it the dampest part of England. It is also windy, although sheltered valleys experience gales on an average of five days a year. In contrast, the coastal areas have 20 days of gales; while the fell tops may have 100 days of gales per year. » Scafell and Scafell Pike Walk - Start at the farm at the end of the road at Seathwaite, distance is 10 miles (7-10 hours) and difficulty level is rated at very hard with rather taxing scrambling up and down. Its all worth it with beautiful views of the area and of the Borrowdale valley but there is 1,500m (4,900ft) of climbing to do! 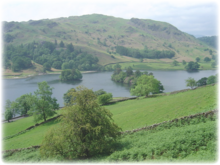 » Fairfield, Great Rigg and Heron Pike Walk - This 9.8 mile ramble starts at the Travelers Rest pub at the side of A591. It includes a sound climb from Mill Bridge on the A591 to Grisedale Tarn and then a steep push up to the summit of Fairfield. Then enjoy gentle walks and beautiful views until its time to descend back to the Travelers Rest pub. This is a very hard walk but most rewarding and enjoyable. » Ambleside to Skelwith Bridge Walk - Classed as fairly easy, this day hike can take up to 2 hours to complete and involves only 225m (740ft) of climbing and is a total of 3.4 miles. Start at the Ambleside Church and get the climbing out of the way right at the beginning so you can then enjoy the views at this higher elevation. » Elterwater Waterfalls Walk - Starting in Elterwater, this fairly easy hike can take between 2 and 2.5 hours and is 4.8 miles long. Climbing is about 244m although there is some roadside walking. On this walk, you will get to see Skelwith Force and the larger multi spouted Colwith Force waterfalls. Try this walk after a recent rain storm (shouldn't be hard to wait for one) as the falls are at their best at this time. 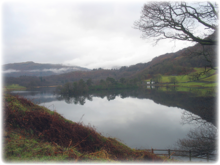 » Hawkshead to Lake Windermere Walk - Begin this 5.5 mile hike in Hawkshead Village and end 2-3 hours later (excluding the ferry crossing) at Lake Windermere. 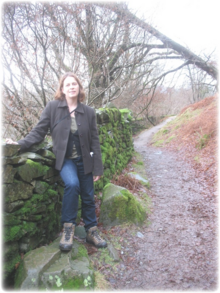 The walk is moderate with easy climbs but has a steep descent down to Lake Windermere. Ferries run every 10 minutes. Some of the views from the fells over Windermere are breathtaking. It turns out a BAD idea is to head to the Lakes in December. Or at least in 2007, it was. 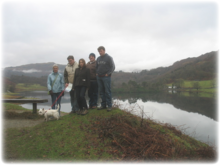 2 days after Christmas, I talked my family, who I was visiting from the States, into joining me in the Lake District. "Come on - it'll be great" I say, thinking of idyllic hikes among the beautiful British fauna and lake scenery from my younger days. The weather didn't exactly comply with my guarantees of fun and only one day out of 3 were we able to head out on a hike. We were all pretty amazed though with how busy the area was even at this time of year. Finding a parking spot in Kendall and Ambleside wasn't as easy as you might expect. Wandering around in the rain for the 2 days before the nice day did prove somewhat interesting. I met my first ever friendly wild swans - who came up to us as though demanding food, which I assume they were used to getting. We had none but they still stood alongside us. Finally, 2 days before the New Year came along and as we were heading off from the Lakes and back to York, the sun came out briefly and the rain stopped. We stayed a few hours longer to do a walk around Rydal Water - a small lake (respectively) near Ambleside. There are many walks and paths in this area but we chose a 3-1/2 mile one. Even this short distance took about 2-1/2 hours what with the climbs and falls, stopping to play in caves, gates to deal with, and, of course, the views to stop and admire. Also it seemed the pause in rainfall attracted everyone from the nearby towns. We came across many other hikers as well as mountain bikers and dog walkers on the trail. The views of Rydal (and at one point, Grasmere) on this walk are beautiful and if I was just as good a poet as Wordsworth, I could maybe be inspired to write the magical stuff he came up with. Sadly I'm not. But I did take this beautiful photo, which saying it was an overcast winters day really came out quite beautiful, I would say. The walk itself follows along the lake shore, by the old track below Nab Scar. The walk starts at White Moss Common. This is about two miles from Ambleside towards Grasmere on the Keswick road, the A591. Shortly after passing alongside the shore of Rydal Water, which is on the left, there are reedbeds, then very shortly afterwards the open area of White Moss Common comes into view. The main car park is on the left (across a wee one-way bridge). The paths are quite well worn so even though we had a book, we pretty much guessed the right way everytime making a big loop around Rydal Water. The great thing about this crisp morning air is it really helps cure those hangovers you couldn't avoid while hiding out in pubs the night before. If you have already decided to stop in York after reading our cultural piece on the beautiful city, why not stay a while longer in the county of Yorkshire and try out some of the walks in the area? With the Yorkshire Dales and the North York Moors, this is a hiker's dream, especially if you like charming little villages and picturesque countryside. Not far from York, drive out to Grassington and try the 5 mile walk on the circular from Grassington via Grass Wood, Gaistrill's Strid and the River Wharfe. Park at the car park in Grassington on the B6265 and head towards the centre of Grassington and find the old footpath leading out towards the farm for this medium level walk that involves some modest uphill walking. 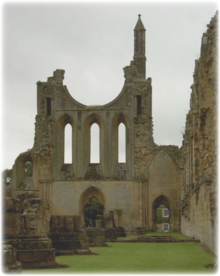 Try out the circular from Byland Abbey via Mount Sneer Observatory at 4.75 miles, which starts at the Byland Abbey and heads towards the village of Wass and then along to a forest track which leads to the Cam Farm and Observatory. The observatory is a disused stone tower was built in 1837 (as shown on the plaque over the door) and originally contained a large telescope. 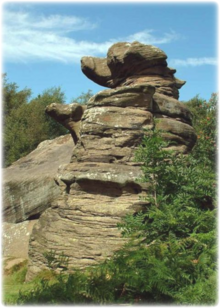 33 miles from the city of York, try breaking up the walking and hiking with an afternoon trip over to Brimham Rocks - rock formations located on Brimham Moor in North Yorkshire. The rocks stand at a height of nearly 300m (985ft). The property is open all year around (typically from 8am until dusk). There is a pay and display car park for visitors as well as a shop, kiosk and exhibition space. There are many variations of rock formations, caused by the sandstone being eroded by water, glaciation and wind, most of which have achieved amazing shapes. England is fortunate to have the kind of rolling countryside that makes it perfect for exploring by bike! The great thing about any cycling in this green and pleasant land is the number of pubs and bed and breakfasts you will find on your route, so just when you are starting to tire, you can lock your bike up and head in for a pint of bitter and a ploughman's lunch to rejuvenate. If you cycle round the cities, English towns have been spending big bucks (or pounds) on "pedestrianisation" of main and historic areas (no cars permitted, in other words) and adding cycle lanes to promote the idea of cycling in Britain. On top of this you will find a public transit service like no other, with buses, trains, coaches, and taxis aplenty when you just need to get a ride to your next destination. The rain can put a dampener on cycling as England tends to have one permanent rainy season but the temperature is perfect for cycling from May (and sometimes earlier) to October. Come July don't be surprised on a hot day to cycle through a park and it looks like the whole country has the day off and is baring as much of their body as legally possible while quenching their thirst with a pack of Stella Artois lager. 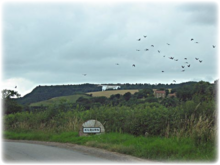 A great cycling destination in England is the region called the Peak District. 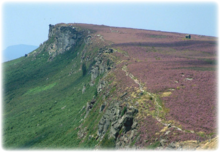 It is an upland area in central and northern England, lying mainly in northern Derbyshire, but also covering parts of Cheshire, Greater Manchester, Staffordshire, and South and West Yorkshire. 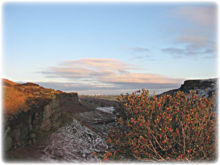 An area of great diversity, it is conventionally split into the northern Dark Peak, where most of the moorland is found and whose geology is gritstone, and the southern White Peak, where most of the population lives and where the geology is mainly limestone-based. Bridleways are commonly used by mountain bikers, as well as horse riders. Some of the long-distance trails, such as the Tissington and High Peak Trails, re-use former railway lines; they are much used by walkers, horse riders and cyclists. The Park authorities run cycle hire centers at Ashbourne, Parsley Hay and Ladybower Reservoir. Peak District food specialties include the dessert, Bakewell pudding (hmmm), and the famous cheese Stilton, one of whose areas of production is the village of Hartington. If you're tempted by the north of England, perhaps you stopped by at York on your way to Edinburgh and feel like seeing what else the north has to offer, stop in Hadrian's Wall Country, a biker's paradise. Hadrian's Cycleway runs between Ravenglass and Cumbria and South Shields, Tyne & Wear and is a total of 174 miles and stretches from east to west coast (and back, if you like). The route is sign posted in both directions but is generally ridden from Ravenglass to South Shields as this takes advantage of the route profile (i.e., short steep hills followed by long down hills). This route can be completed in 2-4 days (the uber fit completing it in 2). If you want to spend more time stopping at the Roman sites, add 2-3 days on top for exploration. There's not just the roman wall to look at but also a line of coastal defenses along the Solway Firth, stretching 26 miles from Bowness to Maryport, consisting of Forts, Fortlets, Turrets and Watch Towers. There were also Roman harbors at Ravenglass and Maryport. If you are up to the additional weight, you can camp on the route or, instead, book to stay in hotels, guest houses and B&B's. Plan ahead to make sure you get a room - especially in summer. Many towns on our near the ends of the trail (and along it) offer bike hire. For a weekly bike rental, expect to pay around Â£60.00 (adult rate). Note about bed and breakfasts in England: Unlike the US where the mention of Bed and Breakfast establishments conjures up images of high priced sleeperies, England B&B's are generally much cheaper and always include a fantastic "slap up" English Breakfast. Rooms are sometimes just nicely decorated spare bedrooms and more than often you will be sharing a bathroom with other people. But this is where you meet up with other travelers and get to talk to the owners about the local attractions. Don't opt for the large super-chain hotel, just drive around until you find a B&B, preferably one within stumbling distance of a local pub. 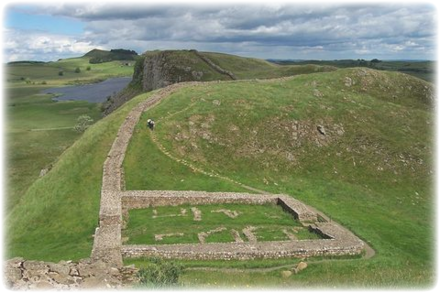 Hadrian's Wall is a stone and turf fortification built by the Roman Empire across the width of modern-day England. It was built following a visit by Roman emperor Hadrian in AD 122. Hadrian was experiencing military difficulties in Britain, and from the peoples of various conquered lands across the Empire, including Egypt, Judea, Libya, Mauretania, and many of the peoples conquered by his predecessor Trajan, so he was keen to impose order. However the construction of such an impressive wall was probably also a symbol of Roman power, both in occupied Britain and in Rome. Fishing through the center of York: All you need is your Fishing License which can be purchased from any Post office, everything else is free. The River Ouse varies in depth from 2-6m (6-20ft) and has a width between 40 and 50m (130-165ft). 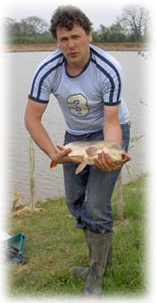 Main Species you can expect to catch in the Ouse in York are: Roach, Bream, Bleak, Perch, Pike, and Eels. For a good roach and Bream catch, try hemp and tares or mashed bread: killer baits! I have had catches approaching the 100lb mark. Roach, Bream and Perch are present in good numbers along the whole stretch. Target a species and pick the appropriate bait. For a mixed catch of species try maggots and Casters. For Pike try spinning or a dead bait. New Walk Terrace, York [Fishing from left bank of Rawcliffe Landing downstream to New Walk Terrace and RSPCA at Clifton to Butcher Terrace, Bishopthorpe Road]. 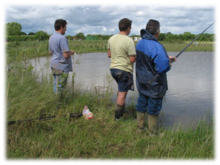 Trotting a stick float, Roach pole and feeder are all good methods. I personally like to fish a center pin reel and fish a stick float, using mashed bread. If you have adventure-travel related experience in this region and would like to add content to this page, please contact us to learn how.